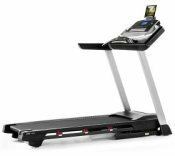 The affordable Proform 8.0 ZT treadmill offers a built-in sound system that lets you enjoy your favorite music while working out on one of the 12 built-in programs. And with the handy Quick Speed and Quick Incline controls, you can adjust any program higher or lower to fit your workout needs. The Proform 8.0 ZT treadmill has a blue-tinted LCD screen that displays speed, time, distance, pulse, and calories burned. You can input your weight into the console’s computer for an accurate calorie-burn reading. UPDATE: The ProForm 8.0 ZT treadmill is no longer being sold. To find a comparable machine check out the new full lineup from ProForm at the company store to see which model appeals to you. 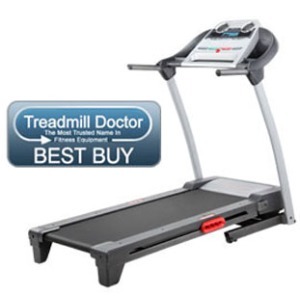 The Proform 8.0 ZT treadmill earned a Best Buy award for 2011 from Treadmill Doctor in its price class ($400 to $699). When you read over the specs, you realize this is an amazing design for what you get for just $599: a 2.25 continuous horsepower self-cooling motor, an 18" x 55" walking area, a power incline up to 10%, belt speed up to 10 mph, deck cushioning with firmer support at the foot-strike and push-off zones, and a SpaceSaver folding deck design. You have the option to buy iFit workout cards ($20 each) which are 8-week beginner through advanced training courses designed by pro trainer Jillian Michaels, or you can simply use the 15 workouts that are pre-installed on the console. The reviews have been mostly favorable on this model. New owners describe the ProForm 8.0 ZT as very sturdy and easy to use. On the downside, they mention that the treadmill is hard to assemble and the LCD display is not backlit so it is sometimes difficult to read the information. The feature-packed ProForm 8.0 ZT treadmill offers big value for a little price. At $599, it cuts some corners on quality, so be sure to get an extended service plan to cover up to three years for parts and in-home repairs if needed. We feel that the 8.0 ZT is a promising entry-level machine but we would take the Horizon T101 over this one (Treadmill Doctor rated that one a runner up to this ProForm). The Horizon has a stronger motor and better service warranties, a clear LED display, fitness fan, and more.